Lasers are ubiquitous in our lives; they are used for such diverse purposes as imaging, communicating, and determining the distance from the Earth to the moon. These devices have even have turned their beams on the art world. Aside from their use in pointing out details on museum tours, lasers have been essential behind the scenes. They have helped to analyze a pigment’s chemical composition and produce three-dimensional cross-sections of art objects, shedding light on their layered history. Where art is concerned, lasers may yet have their most lasting impact in the realm of conservation, helping to preserve pieces for generations to come. The restoration and preservation of artistic masterpieces is a scientific and technological challenge with no universal solution. Conservators must tailor their preservation techniques to the unique material composition of each work in order to avoid irreparable damage. Nearly as complex as the layers of paint or stone are the layers of obfuscating material accreted over years of exhibition and storage. The cleaning of these residues is irreversible, so protecting the art and artifacts beneath is paramount. These lasers provide a noninvasive solution that promises to do just that. One such laser cleaning system has recently been purchased by the Yale University Art Gallery (YUAG). The YUAG’s revolutionary laser cleaning system is housed at the Yale University Institute for the Preservation of Cultural Heritage (IPCH), just a jaunt away from central campus. Surprisingly small, the body of the machine is the size and shape of a microwave, with a handheld gun attachment that is used to aim the laser beam. This technology has the potential to blast away dust and debris from such art objects as marble sculptures. It may eventually be employed on valuable paintings. Before any lasers are fired, conservators must ensure that the cutting-edge cleaning method will not harm the art object. Each material is given a “damage threshold,” an indicator that accounts for how well the unwanted material absorbs energy (the absorption profile) and how much energy must be absorbed to remove the material. Dust typically adheres lightly, and requires little energy to lift from the surface. A layer of corrosion, which is more tightly adherent, requires more energy to be removed. In order effectively remove unwanted material and preserve the underlying artwork, conservators need to tailor the laser’s beam to only affect dirt and dust. Before laser cleaning, this marble bust was covered by layer of dirt and was vandalized with a black pen. Fortunately, lasers heat dark material better than lighter-colored substances. What we experience as the color black is just the absence of reflected light; instead, light is completely absorbed. White-colored material is the exact opposite, reflecting incoming light beams and absorbing very little energy. When targeted by a laser beam, only black material—such as dark stains, dust, or other buildup—absorbs the energy, heating it almost immediately. 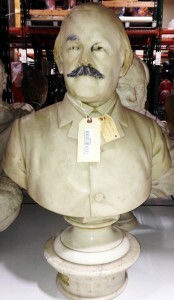 Consider, for example, a soot-covered, marble bust. A marble surface is essentially translucent; it does not absorb visible or infrared light well. These types of light would be suitable for use on the bust, because they would not heat—and possibly damage—the marble surface. Black soot absorbs light that hits the surface exceeding well and requires little energy to be removed. In this case, the laser should use infrared light, which is less energy intensive; the minimum amount of energy should be employed to remove the unwanted material, while avoiding any damage to the surface underneath. A cleaning pulse might last 10 nanoseconds: heat is quickly released, and the material responds just as fast. Heated objects have increased kinetic energy: the atoms and molecules composing the material move faster, and require more space to do so. The material expands as a result. A speck of dust may have been wedged into the surface of the art object; with applied heat, the matter expands, shifting its center of mass upward. The dust simply leaps off the surface of the art. The dark, dirty surface is visible through the middle back, on over the left shoulder. Lasers have exposed the clean marble surface on the right shoulder. For dense coatings of material obscuring a surface, such as a layer of corrosion, the heat-induced expansion results in the microfracturing of the dirty surface. The material is split it into smaller chunks, each of which expand and puff off the surface of the art like a cloud. “You can sometimes see a plume comes off the material, just like you have kicked up a little dust,” said Pablo Londero, associate conservation scientist at the IPCH. The repetition rate for the delivery of laser pulses is another important parameter for protecting the art objects. According to Londero, a slower pulse rate allows the heat from each pulse to dissipate. This mitigates the possibility of heat damage to the art surface; otherwise, the buildup of residual heat from multiple firings of the laser may do more harm than good. Unfortunately, some art surfaces are particularly sensitive to light and heat. For example, historic vermillion pigments are notorious for turning black when subjected to a fair amount of heat. At this point, laser cleaning is only suitable for relatively hardy materials, such as buildings, stonework, metals, and wall paintings. 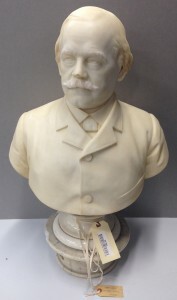 The marble bust is now spotless after laser cleaning. Further, lasers are only part of the solution for cleaning works of art. According to YUAG deputy chief conservator Carol Snow, the mildest methods are always used first. Before the lasers come out, a dirty surface might first be cleaned using water and chemical solvents like ammonium citrate. Laser cleaning, however, may eventually become the best tool to use on delicate surfaces. 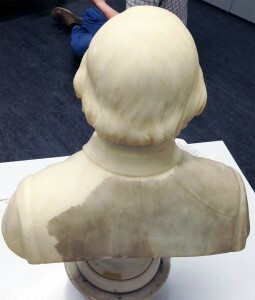 At the IPCH, initial experiments using laser cleaning on a damaged and vandalized bust have had promising results. Snow said the laser cleaned the bust more conservatively than the chemical solvents; in fact, the solvents over-cleaned the bust, exposing the white, internal marble. Given the importance of non-invasive cleaning in art conservation, lasers have the potential to replace chemical solvents—at least in certain situations. Before lasers are employed on more valuable objects, many years of experiments will likely be necessary to fully understand their effect on materials. The laser acquired by the YUAG was designed to clean old varnishes from paintings; as of yet, no one has attempted to use the laser on a priceless painting. Conservators will first test different laser settings on pure materials, a simple canvas with known compositions. They will then test the technology on more complex samples—composed of several different materials—to thoroughly understand the effects of the laser. They may even artificially age a sample to see if laser cleaning can correct some of the effects. Then, and only then, will the gallery experiment on a more expendable piece. Londero said that the process of experimentation and validation of a conservation technique like laser cleaning could easily take decades. The development of this technology is slow going because the stakes are so high. Like drug development in the medical industry, or high-stakes tech projects in the space industry, some things are too important to be rushed.